Due to Eurozone GDP data EUR gained momentum against the USD. On the other hand, the Fed’s decision regarding the rates weighed USD. The support rests at 1.11600 with resistance at 1.11900 which both lines are above the weekly pivot point at 1.11070. The EMA of 10 is rising and has passed the EMA of 100. 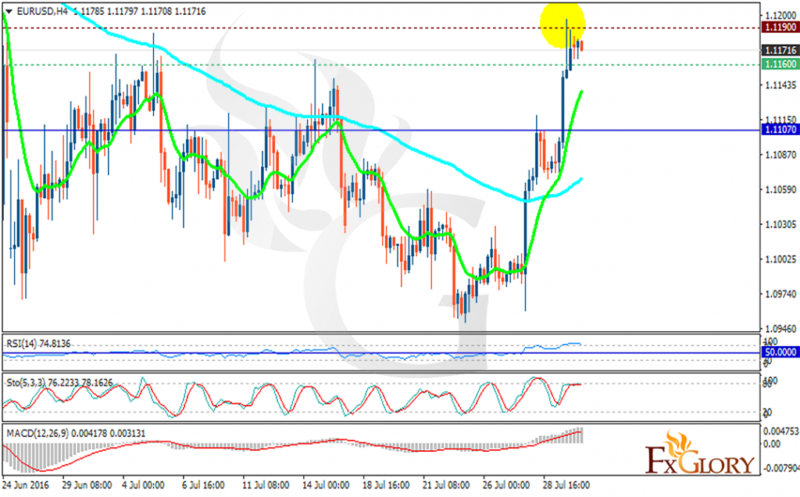 The RSI has reached the overbought line and there is a great chance of falling down, the MACD indicator is in positive territory as well and the Stochastic is showing horizontal line. The potential decrease will target 1.1100 level where there would be a good opportunity for buyers.